Urban received his first architectural commission at age 19 when he was selected to design the new wing of the Abdin Palace in Cairo. He became known around the world for his innovative and unprecedented use of color, his pointillist technique, and his sensuous and decorative use of line. He designed buildings throughout the world from Esterhazy Castle in Hungary to the Ziegfeld Theatre in New York. Urban’s legacy in Palm Beach are his iconic buildings, Mar-A-Lago, the Paramount Theater, and the Bath and Tennis Club. This exhibition will explore Urban’s impressive body of work and celebrate this highly original designer of the late 19th and early 20th centuries. The exhibit includes rarely seen objects that have been archived for more than 90 years, including the only surviving copies of Urban's elevations of the Mar-a-Lago estate, and the only surviving rendering of the demolished Oasis Club. A highlight of the exhibit will be the recreation of the Wiener Werkstätte Showroom in New York. The primary lender to the exhibition will be the Joseph Urban Collection, Rare Book and Manuscript Library, Columbia University, with a variety of important objects lent by: bel etage, Wolfgang Bauer, Vienna; Detroit Institute of Arts; Galerie St. Etienne, New York; Hillwood Estate, Museum & Gardens; the Mar-a-Lago Club; the Metropolitan Museum of Art; Alan Moss; and several private collectors. There are various events held in conjunction with the exhibition, including: a Gallery Talk with biographer John Loring, a Children's Exhibit Activitiy, and a movie screening of Little old New York in the Museum's Grand Ballroom. "This is an intimidating show, the kind that leaves one speechless because the best thing one could say would still do a lame job of describing the works. As you walk the show, keep in mind that before you is not just an artist who took on every project that came his way but one who delivered, extraordinarily, again and again and again." - Gretel Sarmiento, Palm Beach ArtsPaper. The weather vane from the "Gingerbread Castle" on display at the Flagler Museum. 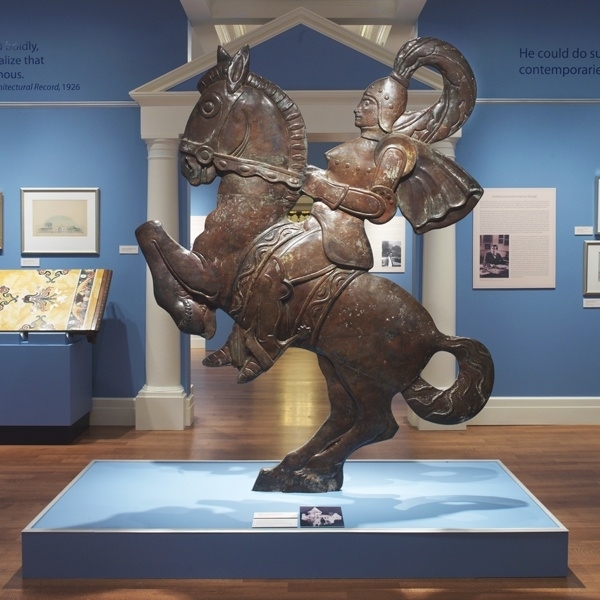 Image copyright Flagler Museum. The "Gingerbread Castle" built in Hamburg, New Jersey, was a promotion for Wheatsworth Biscuits. The company's owner saw the Metropolitan Opera's production of Hansel and Gretel and asked Urban to build a life-sized replica of his stage design. Image courtesy of J. Seffens, New York. Joseph Urban in his office at William Randolph Hearst's Cosmopolitan Pictures, New York, 1920. Image courtesy Columbia University, Rare Book and Manuscript LIbrary of the Butler Library. 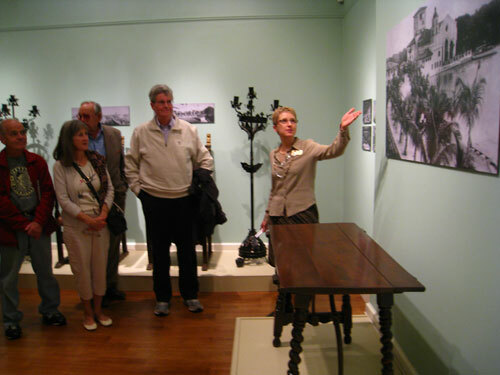 The Flagler Museum recreation of the showroom is a highlight of the exhibition. Copyright Flagler Museum. Visitors tour the exhibition duing the opening reception. Copyright Flagler Museum. Urban's drawing for the Kaiser Bridge in Vienna built for Emperor Franz Joseph II in 1898. Image courtesy Columbia University, Rare Book and Manuscript LIbrary of the Butler Library. Urban's watercolor rendering of Count Karl Esterhazy's country house built in 1899, east of Vienna. Image courtesy of Professor Gerhard Trumler in Vienna. Urban's watercolor rendering of the dining room in Count Karl Esterhazy's country house built in 1899, east of Vienna. Image courtesy Columbia University, Rare Book and Manuscript LIbrary of the Butler Library. Urban's illustration for "The Nightingale," from the (Hans Christian) Andersen Kalender, 1911.Image courtesy Columbia University, Rare Book and Manuscript LIbrary of the Butler Library. Urban's illustration "Der Kleine Rekrut" from King Klang Gloria. Image courtesy Columbia University, Rare Book and Manuscript LIbrary of the Butler Library. Urban's design for the Ziegfeld Theatre was financed by William Randolph Hearst and built in 1926-27 in New York. In 1944 it became an NBC studio, and in 1966 it was razed for an office building. Image courtesy Columbia University, Rare Book and Manuscript LIbrary of the Butler Library. Urban's illustration "Weinachtslied" from King Klang Gloria. Image courtesy Columbia University, Rare Book and Manuscript LIbrary of the Butler Library. Original desk and chair designed by Joseph Urban for Marjorie Merriweather Post's estate, Mar-a-Lago, in Palm Beach, Florida. Copyright Flagler Museum. Figural statue, ca. 1904. Designed by Joseph Urban executed by Franz Barwig. Joseph Urban Collection Rare Book and Manuscript Library, Columbia University. Urban's design for the Paramount movie theater in the Sunrise Building in Palm Beach, Florida, 1926. Image courtesy Columbia University, Rare Book and Manuscript LIbrary of the Butler Library. Set model that evokes Palm Beach's Urban-designed Bath and Tennis Club for the "Umbrella Scene" in Ziegfeld's Palm Beach Girl, 1926. Image courtesy Columbia University, Rare Book and Manuscript Library of the Butler Library. Urban's etching for the ocean facade of the Bath and Tennis Club in Palm Beach, Florida, 1926. Image courtesy Columbia University, Rare Book and Manuscript LIbrary of the Butler Library. In 1927 the Metropolitan Opera Company held a competition to design a new Opera House. Urban proposed this exterior design where the Opera House would be the base of a grand skyscraper. The Met's board decided not to move until 1966 when it relocated to its current location at the Lincoln Center. Image courtesy Columbia University, Rare Book and Manuscript LIbrary of the Butler Library. Urban's proposed design for the interior of the new Metropolitan Opera House. Image courtesy Columbia University, Rare Book and Manuscript Library of the Butler Library. The facade of the New School for Social Research designed by Urban and built in New York in 1930. This was the first Modernist building in America, an astonishing achievement for a veteran of the Viennese Art Nouveau, Ziegfeld Follies, and American Art Deco. Image courtesy Columbia University, Rare Book and Manuscript LIbrary of the Butler Library. Pair of chairs desgned by Joseph Urban executed by Sandar Jaray, 1908. Mahogany wood veneer inlaid with mother-of-pearl, brass, reproduction upholstery. bel etage, Wolfgang Bauer, Vienna. Joseph Urban’s spectacular set design can be seen during a special screening of “Little Old New York” starring Marion Davies. The 1923 classic was the highest grossing film at the time, selling over 200,000 tickets. Davies plays a charming Irish girl who poses as her dead brother to inherit a fortune in 18th century New York. The film’s historical setting features Gilded Age figures like Cornelius Vanderbilt, Washington Irving, and John Jacob Astor. 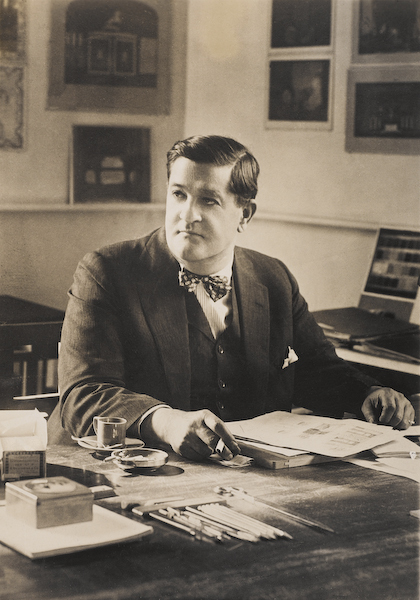 Tour The Extraordinary Joseph Urban with biographer John Loring and learn more about the life and legacy of architect Joseph Urban. Loring, a former New York bureau chief of Architectural Digest and design director of Tiffany & Co., will also sign copies of his latest book on Joseph Urban.